Probiotics are delightful creatures that help keep your digestive system functioning properly, and thereby promote a healthy immune system. Kombucha is a natural bubbly beverage with an abundance of probiotics. Its origins have been traced to Asia. From there, kombucha was brought to Russia and then to Germany and the rest of Europe. It is brewed using tea and sugar through a fermentation process that requires a symbiotic culture of bacteria and yeast (SCOBY). Kombucha can help achieve digestive balance, boost your energy level, detox the liver, and possibly help maintain a healthy weight. For almost a year, my boyfriend and I have been brewing kombucha at home. We have made all sorts of flavors by adding 100% juices, dried fruit and more recently, lavender buds. Remember from my Lavender Chocolate Chip Cookies post? Lavender has great health benefits, such as eliciting relaxation and helping ease insomnia, calming headaches and relieving indigestion. Put kombucha and lavender together and you achieve an all around healthful elixir. If you made a resolution about health this year, you would not be alone. Whether you are looking to drop the weight you collected during the holidays, exercise more, or add vegetables to your diet, you have company. My opinion is that balance is very important; kombucha is one component that helps to create balance, as it works wonders for your overall health and thereby your state of mind. If brewing kombucha at home is not your thing, no biggy. If I were to encourage any health habit it would be to get probiotics into your life regularly through natural foods such as store-bought kombucha, yogurt, kefir, or other fermented foods such as sauerkraut. I posted a How to Make Homemade Kombucha back in May, so simply follow the steps in my earlier post prior to following this recipe. You’ll need to start with 2 gallons of already prepared kombucha (you can scale the recipe up or down as needed), and from there, the instructions in this recipe are to flavor the kombucha and to put it through a secondary fermentation. 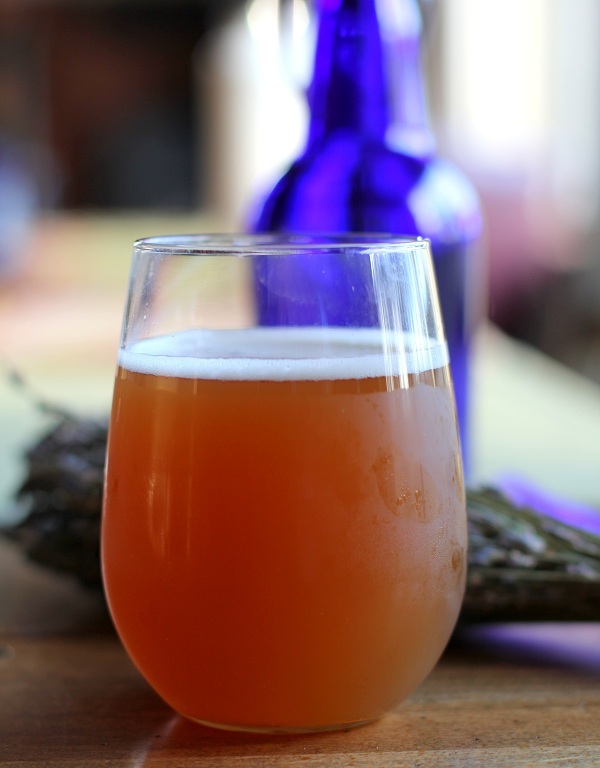 Brewing kombucha at home can be risky, and drinking kombucha is not for everyone. I encourage you to use caution when brewing kombucha and to pay attention to the way your body feels after drinking it. If you are new to home-brewing, please respond to this post or email me with questions. 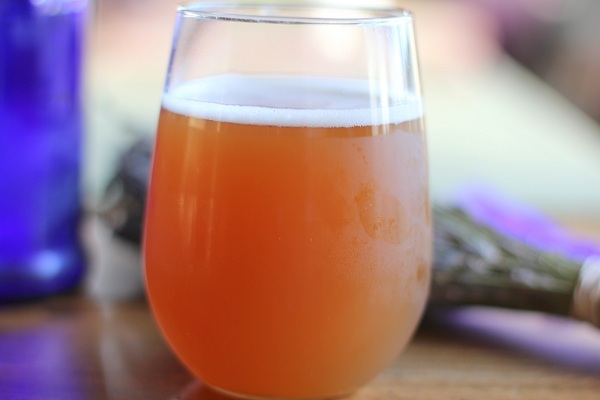 Note: I published a cookbook called Delicious Probiotic Drinks that includes everything you need to know about brewing kombucha at home, as well as delicious ways of flavoring it. In a large pot, heat a gallon of water until boiling. Romove pot from the heat, add the black teabags and lavender buds. Allow the tea to steep 12 minutes then remove the teabags, but leave the lavender buds in. When cool, Carefully pour already prepared homemade kombucha into the pot with the lavender tea. Follow the normal steps you take to store your kombucha, leaving the lavender buds in the kombucha (you’ll be straining the buds out when you’re ready to drink the kombucha). I bottle my kombucha, so from here, I pour the lavender kombucha into a pitcher and then pour from the pitcher into the bottles. Do you want your kombucha to go through a secondary fermentation? If no, then simply refrigerate your lavender kombucha and strain the kombucha before drinking. If you would like to put the kombucha through a secondary fermentation, store the bottles (or whatever vessel it’s stored in) in a warm, dark room and leave for 3 days. This will allow the probiotics to process the newly added sugar. After the secondary fermentation is complete, refrigerate it and strain the lavender buds out when you’re ready to drink it. Keep in mind, brewing kombucha at home can be very risky. If your SCOBY ever looks strange to you, consult someone you know who is an experienced kombucha brewer. If not, discard the SCOBY and start over – never take risks with your digestive health. Also never store kombucha in anything made out of ceramic or plastic. Stick to glass. 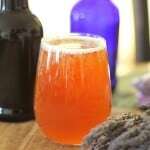 If you are new to brewing kombucha and have any questions, please don’t hesitate to email me. For detailed instructions on brewing kombucha, ginger beer, kefir, and other fermented probitoic beverages, pick up a copy of my cookbook, Delicious Probiotic Drinks ! Thanks for the recipe! I have always been too intimidated to make my own kombucha but this sounds very doable! We are cutting back on our alcohol consumption this year and kombucha is the perfect beverage when you are craving a beer! Completely agreed! I love drinking kombucha with dinner and because there’s a small amount of alcohol in kombucha, it helps to relax you without giving you an actual buzz. Lots of fun! Good luck with your resolution and let me know if you end up brewing kombucha at home!! Hey Monet, I’m so glad you asked that question and to honest with you, I don’t know the answer! I’d ask your doctor before trying it. I would think probiotics would be great during pregnancy, but I imagine kombucha (especially homemade) may be harsh on your stomach or give you indigestion since it is naturally carbonated. Let me know what you find out and congrats again on the new addition to your family!! I’m so excited to try this! Where do you get the scoby? Katie, I’m so happy to hear you’re interested in making kombucha! We got our scoby off the internet at this site: http://www.organic-kombucha.com/kombucha_cultures.html If you order one over the internet, just be sure you’ll be home on the day it’s supposed to arrive because it shouldn’t get too hot or too cold if it isn’t fair weather 🙂 Let me know how it goes!! We grew our own scoby. Instruction online. Takes a while almost a month. Its more self reliant. I have been really interested in brewing my own at home. I was wondering…why do you say home brewing it is risky? What should I avoid or look out for? Thanks! Hi Erica! I’m so glad you’re interested in making your own kombucha! The key is to avoid contamination through every step of the process by simply keeping everything sanitized and not allowing anything to get in the kombucha while it’s brewing. First off, using well-santitized instruments (jars, pitchers, bottles, stirring spoons, etc) is key. While the kombucha is brewing, it’s crucial to keep it covered but still allow it to breathe. And when it comes time to bottle, making sure the bottles are glass with a secure lid is important. Every 3 to 5 batches, I recommend sanitizing the jar/jug that you’re brewing the kombucha in and sloshing some vinegar around in it. You can simply place the scoby in a casserole dish (with some kombucha liquid) or bowl while you’re cleaning out the jar and then put it all back in when you’re finished sanitizing it. If at any time you notice mold growing on your scoby, throw it out. Mold that grows on scobys looks similar to bread mold – either circular patches of white, green or black fuzzy mold. I myself have never had mold grow on my scoby, so as long as you make sure the Scoby doesn’t get contaminated, too hot, or come into contact with direct sunlight for prolonged periods, you should be fine. As a side note, there are brown stringy cultures of yeast that grow underneath the scoby and they tend to look very strange, but they’re perfectly normal. Additionally, it is possible to brew your kombucha too strong by allowing it to ferment for too long. In this case, you can still use the kombucha but need to dilute it using more liquid such as tea, water or juice. If kombucha tastes or feels too strong to drink, it probably is…so simply dilute it. The optimal PH should be between 2.5 and 4.6. You can buy PH test strips to test it, but you certainly don’t have to. I read that you shouldn’t drink more than 6 ounces a day of home-brewed kombucha because it’s stronger than store-bought, but truthfully, I do drink more than that and haven’t had any issues. Mostly, my words of caution are to use your best judgement. It’s actually pretty difficult to mess up the process as long as you follow the steps. The first batch of kombucha will seem grueling but once you get the hang of it, it’s really easy and fun!! Good luck and let me know if you have any questions along the way! Thanks for sharing your ingredient that helps people keep their health up naturally. I used to drink Yakult a probiotic milk, I find these products not only delicious but also perfect for digestive system & as far as I know it contain a special strain of the bacterium Lactobacillus casei Shirota that contains billions of live and active “good bacteria. I’m kind of confused. The ratio here has 2 gal kom and then you add another gallon of new brewed lavender tea but most of your other recipes have 2 gal (or nearly after taking some to protect the SCOBY) and then just the flavorings with a small amount of simple syrup type water. Is this lavender kom more diluted than the other recipes? The more liquid you add to your kombucha prior to secondary fermentation, the more dilluted it will be. However, in order to infuse the kombucha with enough lavender flavor, you need a decent amount of lavender tea, or else the lavender flavor doesn’t come through. The kombucha still goes through the secondary fermentation just fine, and the probiotics have ample “food” in order to grow, so you still end up with a good deal of probiotics. If you’re concerned about your kombucha being too dilluted, you can use less lavender tea. Does all of that make sense? Thanks so much for your interest and let me know if you have any more questions!! I’m a bit confused too; is this recipe what to follow for the secondary fermentation? So, I’d mix the lavender/sugar/new tea with the already fermented kombucha and immediately bottle? Or is this for a first fermentation where I’d put it all in a dark place for 10ish days then allow a 2nd ferment? Brown bottles are better because they allow less light in, and probiotics aren’t a huge fan of light. Hope this helps and let me know if you have any other questions! Happy brewing! Hi! Out of curiosity, yours is the only website that states to brew the lavender in with the hot tea; all other sites say to put lavender in after the initial fermentation period. Also, can elderberries be added in during the initial fermentation (with the lavender) or should those be added after? Thanks! You add the lavender tea in for the secondary fermentation. So essentially, you brew a batch of kombucha, and once it’s finished, you make a batch of lavender tea, allow it to cool to room temp, and then combine it with your brewed kombucha in a seperate pitcher before bottling it. When it comes to primary fermentation, you should always only have the SCOBY in sugar sweetened tea and no other ingredients. For that reason, I don’t recommend adding elerberries for the first fermentation, but you can definitely do so for secondary. Does all of that make sense? hi. i am making my 1st Kombucha ! can i put some pure essential Lavender oil in the bottles ? I like Kombucha, but i never drink a beer, alcohol or wine in my life. is there a way to remove the alcohol from Kombucha >? how do you strain your lavender? I grow fresh lavender in my garden. Can I use fresh sprigs or does it have to be dried? And when you say buds do you mean just the flower part no stems? I’m new to using the herb in the kitchen. Hi! Should the lids be shut tightly during the second fermentation or should I use a breathable cloth to cover as in the first? Thank you, can’t wait to make this!